The following is a historical article, originally printed in the Sunday World-Herald, Magazine of the Midlands, September 18, 1983, written by James Denney. When William A. Hollstein rises this morning and peers out the window of his comfortable brick home to see if the sun is shining, his thoughts probably will drift back 53 years to another September 18, 1930-and a bank robbery that most Nebraskans have forgotten. As an inquisitive 15-year old high school youth, then living in Hay Springs, Nebraska, he witnessed the First National Bank heist, standing in the bank doorway while one of the five holdup men kept a revolver in his ribs. Hay Springs (with a current population of 628) in northwest Nebraska is a Sheridan County community on Highway 20, just 11 miles west of Rushville, the county seat. Eastbound Passenger No. 6 from Deadwood was running late on Thursday, June 25, 1908 and had not yet reached Chadron. On a normal schedule, Freight No. 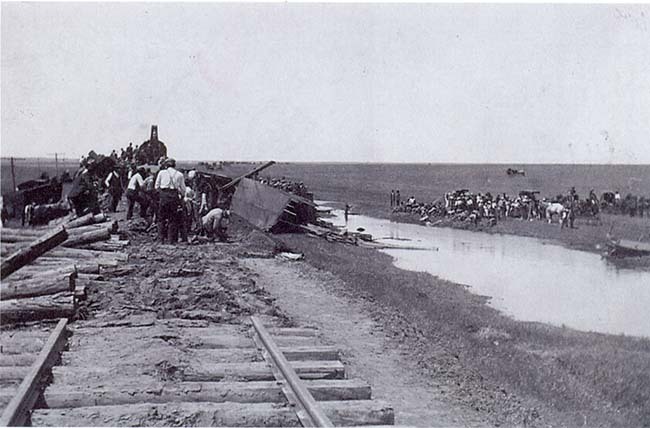 116 departed the Chadron yards immediately after No. 6, but on this particular night it was permitted to pull out ahead of the delayed passenger to begin its journey east. The doubleheader freight with locomotive #229 in the lead and #9 trailing, pulled thirty cars of mixed freight. The consist that evening was mostly boxcars loaded with lumber from the Black Hills or cars loaded with coal from Wyoming to be dropped off at various towns down the line. Engineer James W. Pace was in the lead locomotive with fireman James A. Harris. The second locomotive held engineer Willis A. Graham along with fireman August Meyers and brakeman Fred Ebener. Conductor Walter White and brakeman James L. Gier, were at the rear of the train in the caboose. An estimated ten to fifteen tramps also rode the late night train on the bumpers (couplers) between the cars, underneath on the truss rods, and few luckier ones managed to find open doors on boxcars. Nearly every tramp was riding near the front of the train. This year the Rushville Armstrong House Museum is celebrating the 100th Anniversary of the Gourley Opera House/Plains Theatre and the coming of electricity to Rushville. In 1914 David Gourley decided to build a theater for moving pictures, but he needed electricity. So, Gourley built an electric plant and theater. The theater was also a success. In the 1940s ‘50s and ‘60s, the Plains Theater entertained the community with movies. In 1988 it was added to the National Register of Historic Places. Today, the theater is used by the Sheridan County Players, whom recruit actors throughout Sheridan County and have produced many outstanding plays and musicals. Come visit the museum to see the Gourley display and the many new additions, like the new roof on the log cabin post office, the cookstove in the kitchen and other items. We are open Monday through Friday and by appointment by calling Jerry Wellnitz at 327-2985 or 360-0299. Becca, Ryan, and Zak Wellnitz volunteered to help Jerry Wellnitz shingle Rushville Museum’s Log Post Office. After shingling most of the first half, Jerry got the antique shingling machine used by Walter E. Blum from 1924 to 1940 to see if it still worked. Kerry Retzloff donated the right size of shingle nails for the shingling machine, and by the time they were done with the second half of the roof they had a system worked out. Becca laying the shingles out, Ryan starting the nails with the shingling machine, and Zak driving the nails in. The Wellnitz kids said the only thing worse than putting wood shingles on is tearing the old suckers off. In the spring of 1884, a group of 104 men, women and children headed west from Sullivan, Indiana with the hopes and dreams of starting a new community in a place called Antelope Valley (present day Gordon). Among the group was a 38-year-old father of 4 named William Clark Scott. His plan was to establish a homestead and then return to Sullivan and accompany his family to Nebraska. During his return trip, he brought his family and belongings by train to Valentine and then trekked across the sand hills by covered wagon. The Scott family recently donated the very oxen yoke used by the William Scott family in 1885. The yoke is now on display at the Scamahorn Museum. Welcome to the new website for the Sheridan County Historical Society in Sheridan County, Nebraska. Here you will find everything you want to know about our area museums.